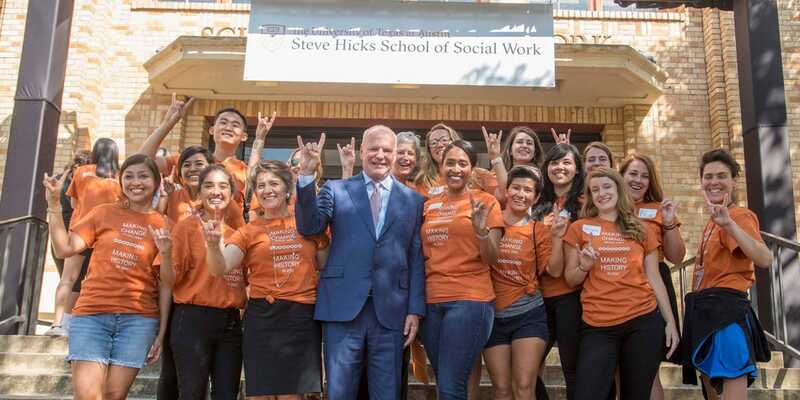 Upon graduation, students in the Steve Hicks School of Social Work go on to become your community organizers, counselors, and policy analysts, touching the lives of thousands of individuals through the course of their careers. 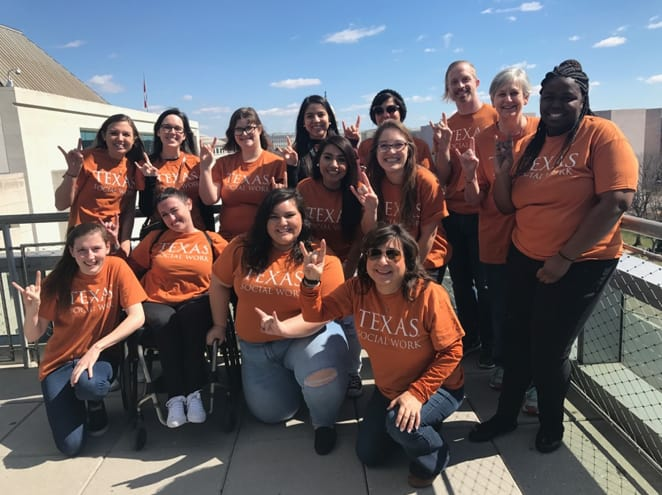 To prepare for this vital work, Texas Social Work students need to go to the heart of where policy change happens—Washington, D.C.
Recognizing this, the DiNitto Center for Career Services at the Steve Hicks School of Social Work created Washington Calling which saw its inaugural seminar take place during spring break 2018. 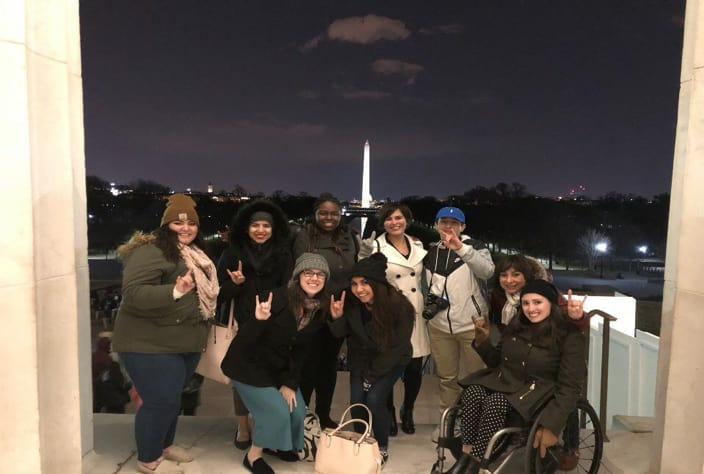 This week-long program will provide Texas Social Work students access to intimate discussions with legislative policy makers in federal agencies, policy think tanks, and national advocacy organizations. These connections will empower students to experience the unique ways in which social workers can create systemic change. 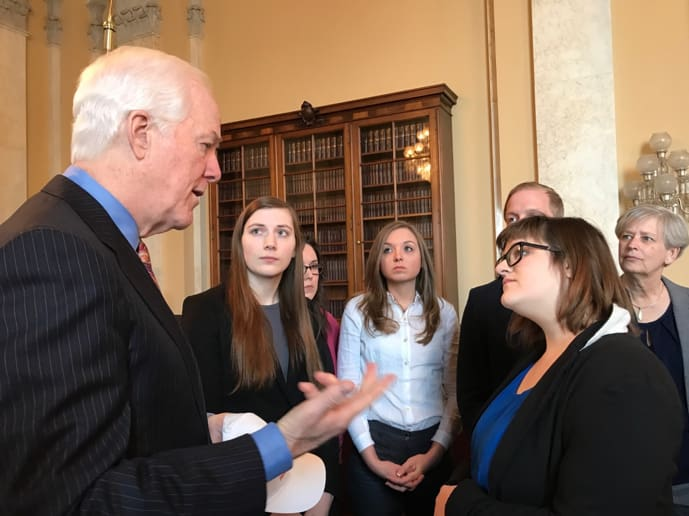 John Cornyn and Alissa Sughrue discuss a policy loophole that Alissa discovered. As we enter another year, we issue a call to action. Now is the time that Washington is calling to social workers and social work students who hold valuable knowledge and skills to shape our nation’s capital, the legislative process, and policies which are created on the hill. The Washington Calling program capitalizes on UT’s strong alumni base in D.C. and at the same time, will strengthen UT's future presence in the area. While this week-long experience is invaluable to our students’ careers, many of them cannot afford to go without outside funding. In 2018, through our students’ fundraising efforts and with the support of donors like you, we were able to send 13 students to Washington D.C.. With your support, we will be able to fund this trip and give our students the learning experience of a lifetime! Please donate today! We proudly represent UT all the way in Washington! There are 5 social workers serving in U.S. Congress! Our cohort consists of 15 passionate students. 23 monuments make up the National Mall. During our time, we will be visiting with approximately 40 people to enrich our understanding of social work in our nation's capital. 68 square miles make up Washington D.C. There are approximately 110 Steve Hicks School of Social Work alumni working in D.C.
Congress is in session for 138 days! On March 17 we "march" to D.C.
1,523 miles span between Austin, Texas and Washington D.C. The 2018 Inaugural Cohort of Washington Calling paved the way for Steve Hicks School of Social Work students.